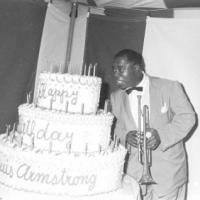 Tune in on July 4th as we celebrate the chosen birthday of Jazz great and American hero, trumpeter and vocalist Louis Armstrong. We will play 24 hours of only his music beginning at midnight. Louis was born in New Orleans at the turn of the century (officially on August 4th) and grew up surrounded by a vibrant musical culture informed by the rags of Scott Joplin and the funeral marches that comprised the New Orleans music scene.